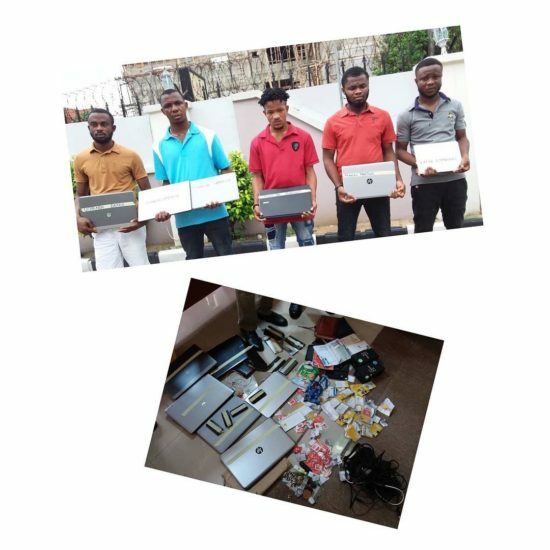 EFCC’s Uyo zonal office, on Wednesday April 3, 2019 in a sting operation in Akwa Ibom state arrested five internet fraudsters. The suspects are Uchendu Denis, Osinachi Sam David, Chikezie Bright, Francis Martins and Okafor Emmanuel. They were arrested at Nsini Odeyop Street, Shelter Afrik Estate, Uyo, Akwa Ibom State, following intelligence report of their suspicious activities. At the time of arrest, it was discovered that the suspects, who were lodging in a 3 bedroom flat, used one of the rooms for their cyber crime activities. Items recovered from them include: 123 sim cards, including a Turkish sim card, 6 Laptops, 13 expensive mobile phones, several books and diaries containing several phone numbers and over 300 email addresses, amongst others.